Mardiguian, Controlling Radiated Emissions by Design, 2nd ed. 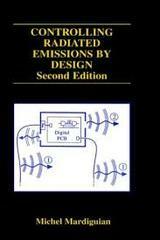 Controlling Radiated Emissions by Design, 2nd ed. In all possible industrial, military and household/personal applications, the number of digital devices operating with data rates of hundreds of Megabits, using processor chips with Gigahertz clocks, has increased astronomically. At the same time, a myriad of popular RF receivers like portable telephones, laptop PCs with integrated wireless modems, wireless Internet, and other electronic devices, are becoming ubiquitous, such that the number of sensitive, licit receivers operating within a square kilometer of an urban area can be counted in tens of thousands. In the crowded space that they share, the conjunction of both events is increasing the number of potential interference situations, especially in the upper VHF and UHF regions where spurious radiations are most difficult to contain. There is, in addition, a growing, although controversial, concern about the possible health hazard caused by long exposure to near fields of low power radio transmitters. All these aspects result in a continuous effort for lowering RF radiations. This new edition of Controlling Radiated Emissions by Design retains the step-by-step approach for incorporating EMC into every new design, from the ground up. Quite different from other classical EMC books, it approaches the problem from a development engineer's viewpoint, starting with the selection of quieter IC technologies, their implementation into a noise-free printed circuit layout, and the gathering of all these into a low radiation packaging, including I/O filtering, connectors and cables considerations. Equally far from a cookbook of recipes, all guidelines are supported by thorough, but relatively easy and comprehensive calculated examples, allowing a quantitative design, instead of purely qualitative. New to this edition is material on surface mount techniques, IC's ground-bounce, random-versus-periodic frequency spectra and recent progress in low cost ferrite and filter components. Also included is detailed information on radiation from high-speed chips (e.g. Pentium >200 MHz) and the efforts by some manufacturers to reduce it. The book has numerous tables, all of which have been updated to reflect the latest changes in the field, including a brief overview of the U.S. and worldwide emission tests. Controlling Radiated Emissions by Design is an invaluable tool for helping design engineers, EMC specialists and technicians develop more efficient and economical control of emissions. Foreword. Preface. 1. Generalities on Radiated Interference. 2. Electric and Magnetic Fields from Simple Circuit Shapes. 3. Fields Radiated by Nonsinusoidal Sources. 4. General Strategy for Designing a Low-Radiation Product. 5. Controlling Radiated Emissions at Chip /Integrated Circuit Level. 6. Printed Circuit Board Design. 7. Emission Control in Mother Boards and Backplanes. 8. Controlling Radiated Field from SwitchMode PowerSupplies. 9. Reducing Radiated EMI via Internal Cabling and Packaging. 10. Box Shielding. 11. Controlling Radiation from External Cables. 12. Principal Radiated Emission Specifications & Test Methods. 13. Troubleshooting Radiated EMI Problems. Appendices. References. Index.